This is a Belgian HGU-26/P flight helmet. It was used by the famous Belgian Tiger Squadron. This helmet was flown on a F-104 Starfighter aircraft. It has all of the era's avionics and the MBU-5/P oxygen mask with single bayonet fittings. 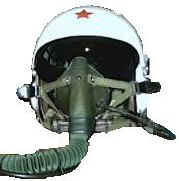 Chinese TK-2A Flight Helmet with a YM-6505 pressure-demand oxygen mask, standard equipment for Chinese fast-jet pilots. The TK-2A is also compatible with the Russian KM-32 mask and has Russian-type electronics connectors. Royal Dutch Air Force Helmet worn by Dutch pilots who fly the F-16's. Military aviation in New Zealand started in 1912 with two Army Staff Officers being sent to the UK to learn the science of flying. The flying corps received its first aircraft, a Bleriot, in 1913. The Gueneau 458 flight helmet is used by the French Air Force. It has a double visor (tinted or transparent) activated by levers on each side of the helmet. The oxygen mask is an Ulmer 82GK. This helmet replaced the Gueneau 316 which was used in the 80's. The HGU 55/G is the helmet of choice for the German air force. It uses the MBU 5 oxygen mask. The helmet was used by Tornado fast-jet pilots. It has all of the original avionics and tinted visor. 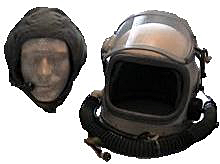 The MK 1 Royal Air Force (RAF) Flight Helmet has an inner cloth helmet which contains the avionics (speaker & microphone) and also has the M-type Oxygen mask. There is also a tropical cloth head harness. These harnesses were used when flying in tropical conditions. The GSH-6LP has 8 locking lugs which fasten to the flight suit. The visor is electrically heated to keep it from fogging. It snaps down onto a gasket surrounding the faceplate. The locking neck-ring is also an integral part of the GSH-6. The ZSH-3 is the world's most widely used jet-age helmet (worn in virtually every type of Russian aircraft). It has an aluminum frame and shell, rubber pressure seal, oxygen regulator and visor with internal heating. Recent versions have a mounting bracket for targeting system. 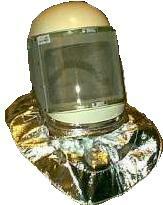 The GSH-6A is a high altitude pressure helmet. It is complete with a fire retardant, inner communications helmet with microphone and earphones, internal sun visor, aluminum neck-mounting ring and retention cables. The MFF-201 Protective Fire Fighter helmet is used when fighting aircraft fires. It is made from a white resin, with face shield which has a screen material sandwiched between two layers. The face shield can flip up. Attached to the lower part of the helmet is an aluminum covered fire-proof cape. A current issue U.S. Air Force Flight Helmet model HGU-55/P. It has the oxygen bayonet receivers & the metal communications cord clip holder. The interior has a thermal plastic liner. The helmet is fully wired with military H-143 earphones. This is a U.S. Navy Gentex HGU Flight Helmet complete with the MBU 12/P oxygen mask. This helmet was used by fighter pilots who flew the F-14 Tomcat jets. It also has leather ear seal cups and is complete with all of the avionics, microphone and speakers. The exterior of this helmet is covered with 2" white reflective tape and has the design that commemorates the Naval Air Facility Atsugi, home of the Carrier Air Wing Five, and the marking for the United States NAVY Fighter Squadron One Five Four (VF-154) Black Knights. This helmet was used by the U.S. Government for Astronaut training at the Johnson Space Center. It is from the Apollo era of space exploration. The tinted visor can be manually raised or lowered.